Choose a Honda Vehicle to Discover New Terrains Like Never Before. When it comes to powersports innovation, Honda is the master. Honda vehicles combine state-of-the-art handling and power with exceptional comfort and safety features so you're ready for anything mother nature throws at you. In summer or winter, rain or shine, trust a Honda. Located just outside Sioux Falls, SD, Interlakes Sport Center LLC carries a complete inventory of Honda Powersports vehicles for any riding lifestyle. From ATVs and Side by Sides to Dirt Bikes, Street Bikes and more, we’ve got the Honda vehicle you’ve been waiting for. Feel free to browse our most popular models below or stop in to ride off in yours today! Whether you’re exploring your trails, tackling hard work, or on a wild hunt, there’s a Honda ATV geared towards your outdoors. 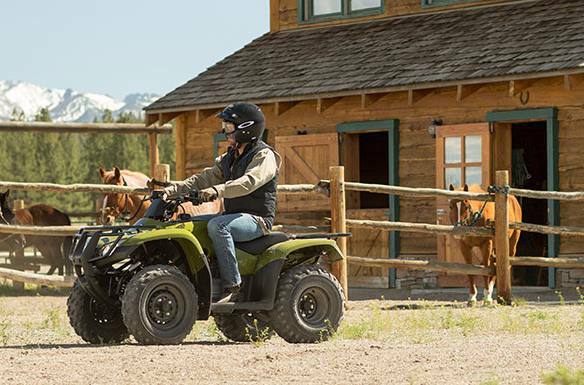 Find the right ATV model for your lifestyle, including utility/recreation, sport, youth, and utility models! Honda side by sides are up for year-round performance. Play and work with up to five fellow outdoor enthusiasts and ride with fold-down seating, impressive hauling and towing capacities, and a variety of eye-catching color schemes. You want a sleek, industry-leading bike to take on the open road. Choose a Honda streetbike. Adjustable seating, digital fuel-injection, unparalleled good looks, and quick handling sets these motorcycles apart from the rest. Whether you’re racing the track or dominating trails, Honda dirtbikes have your back. Every model is lightweight and nimble, yet offers impressive torque and power so you’re always leading the pack. Your long road trips call for comfortable cruiser/v-twin bikes. Deep, plush seats keep you relaxed on weekend-long rides while classic, solid style matches your need for a timeless machine. Looking for a quick way to get around town? Consider a Honda scooter. Each model features unique, contemporary styling, efficient storage, top-notch handling, and simple maneuverability.